Stir together tomatoes, basil, parsley, oregano, garlic and olive oil in a glass bowl. Add salt and pepper to taste. Add salt at the end, as it tends to break the tomatoes up. Preheat the oven to 300° F. Brush baguette slices with olive oil, salt and Italian seasoning and place in the oven. Remove when slices begin to brown. Spoon the tomato mixture onto the toasted baguette slices and you’re ready to eat. 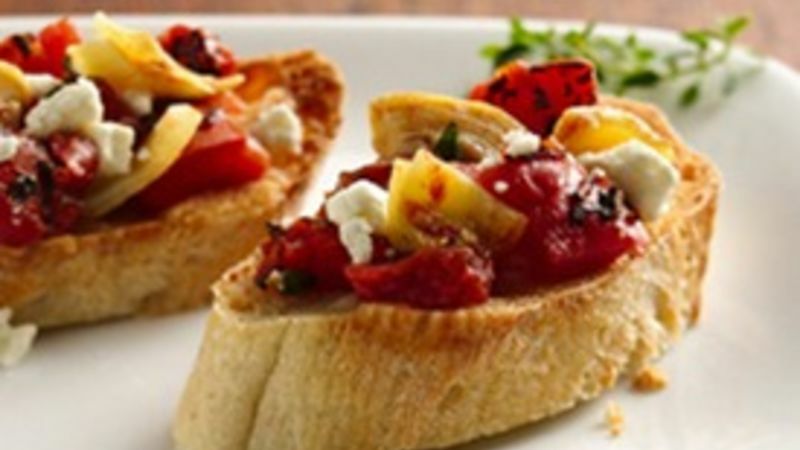 To bring out the beautiful colors of bruschetta, serve on white plates and enjoy! Roasted garlic, tomato pesto and pine nuts, Parmesan cheese and a thin slice of salmon, red peppers, sautéed mushrooms, mozzarella, finely chopped olives and sweet onions. Experiment and make your bruschetta your way! Bruschetta is best consumed fresh and warm. Discard any that has been at room temperature for more than two hours.